Oh God. Is anyone here allergic to nuts?! On a recent business trip to Munich, I was lucky and honored to be invited to dinner at the spectacular, Michelin-recommended Rilano No. 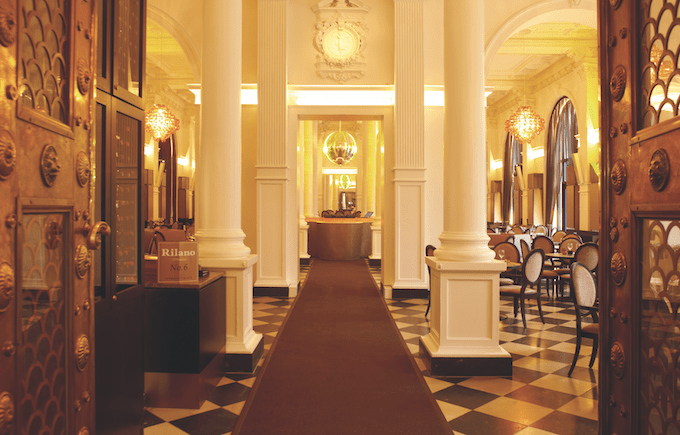 6 Lenbach Palais, a trendy yet classic up-scale restaurant located in the very heart of historic Munich housed within an imposing building known as the Bernheimer Palais. Rilano No. 6 Lenbach Palais as seen from the outside. What a place! The visit being staged as a total surprise, I had no way of preparing myself for the experience, but still I decided rather quickly upon arrival to grab a few notes and pictures to document the experience. 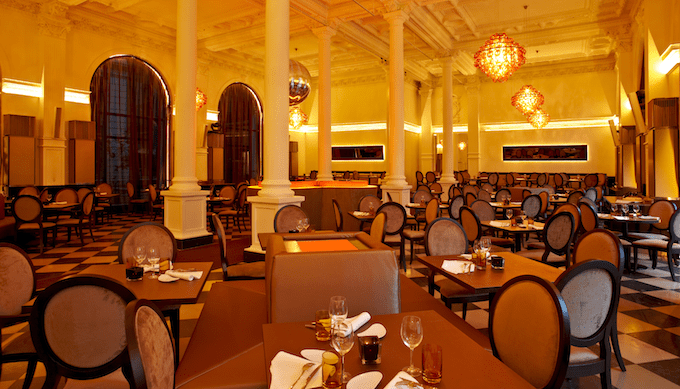 After all, how often does one get a chance to dine in such fine surroundings? Rilano No. 6, if one is to believe the hype, is a rising star on the Munich food scene, attracting both the in crowd and those looking for a more casual dining experience. The setting is lush, luxurious and classy, but the feeling of the place is strangely laid back, relaxed and upbeat. It’s a strange, captivating mix of Moscow nightclub meets European luxury. From the street, one is led into a large connecting hallway/atrium with marble floors, wooden wall panels, unbelievably high ceilings and carved Greco-Roman columns. From this central position, one can either turn left to go the bar (with seating and menu) or right to go to the restaurant. We took a right (for starters) and headed for the main dining room. Rilano No. 6 – A peak through to the main dining room from the entrance hallway. “One really expects a roman gladiator to show up and guide you to the spa,” a female dinner companion whispered to me as we strode on. “I’m glad I didn’t leave my jacket at the hotel,” I whispered back before being shunned to silence by the appearance of the room in front of me. The pictures will do it some justice, but believe me when I say that this is a pretty imposing place of lush luxury and visual inputs. We arrived at the tail end of a pretty large party of diners so the place was rapidly filling up and buzzing with activity, chatter and laugh. The high ceilings made for quite an ambiance and a lot of noise, but such was the trendy laid-back feeling of the place that you didn’t really seem to mind. Tables had been pushed together to accommodate us in large, loud groups of excited diners and snacks had already been put out to keep us from going hungry until the food arrived. As people found their places, a small army of waiters buzzed around us, filling wine glasses or fulfilling alternative drink orders so no-one would go thirsty either. Before I go any further, please allow me to explain that we entered Rilano No. 6 as a large group of probably 50 or so diners. As such, a special menu of four dishes had been created specifically for our visit. These do not appear to be part of neither the a la carte or tasting menu at Rilano, but still seemed a pretty solid indicator for the kitchen’s abilities. The dishes were not introduced to us by the staff neither prior to or during their arrival, however, for those of us curious enough, little printed menus were placed at the center of our community tables. I myself was lucky enough to get a peak beforehand, but those not very attentive or those placed at the ends of the table were eating in total blindness. As we shall soon see, this proved a bit of a issue for at least one diner. We also did not have specific wine pairings with the different dishes, we were given a choice of white or red wine intended to match all dishes served. I’d love to have seen separate pairings for each dish, but this, I assume was the decision of our generous hosts, not the restaurant. And totally understandable, of course! Bread and butter: a perfect start? Having settled on a spot to sit, I tucked into the snacks set in front of us in little, community baskets: freshly sliced bread, olive oil, flaky sea salt, compound butter and a reddish relish that very quickly turned out to be made of fiery hot chilies. All of these things were set out in the middle of the table, so you got to “fight” your fellow diners for the chance to built your own appetizer on your side plate. Great ice breaker, that. As for bread, there were two kinds to chose between. One a fairly standard white baguette type of thing, another a deep, brown, wonderful whole-grain walnut bread. The olive oil was sufficiently characterful, peppery and pungent, the salt of great quality and the butter nice and creamy. The chili relish? I’d love to tell you, but honestly the moment I touched even the tip of my tongue to it, it grew my taste buds straight off. This concoction was hot, too hot, even for me and I’m a chili head! Chili, generally, is a bad idea in an appetizer because you run the risk of scorching the diner’s taste buds, causing subsequent dishes to feel more bland than they really are. I’d have preferred a slightly sweet, roasted pepper relish or spread, with maybe some red pepper flakes for heat. Or I’d have liked to at least be warned about the heat. In my glass to help me soothe the burn and get my saliva flowing for the meal to come, I was poured the white selection from the wine list, a 2012 Riesling “Bodenschatz” QbA from Weingut St. Antony which was pretty much everything a young entry level Riesling should be: nicely acidic, full of minerals with notes of tropical fruit (peach, apricot) and some gooseberry, as it warmed up and had a bit of air the fruit built and some complexity started coming through, but nothing major. For the occasion, it was extremely enjoyable and drinkable, though. Having downed most of a glass of wine as well as a lot of local, fizzy water to help soothe the burn of the treacherous appetizer, I was happy to see another small army of waiters starting to rush out with the first plate of the evening. Off to a great start: Australian prawn, broccoli cress and three spins on cauliflower. Apparently one of the mantras of the head chef at Rilano No. 6 is that his dishes should be simple, have few ingredients and not feature too many components that could possibly overpower one another. And the first serving of the evening truly was a study in the power of simplicity. The star player of the dish was an unusually large Australian wild prawn, cooked and served whole aside a bed of bitter greens and several variations of cauliflower. I’m not usually a fan of shrimp or prawn, especially not the larger varieties, but this was actually nice: Firm fleshed but not chewy, cooked to absolute perfection, slightly sweet, decidedly seafood-like yet very mild and subtle in flavor. If anything, the flavors were possibly a bit too mild and a few of my co-diners actually expressed a desire for a little more oomph. A tiny shake of seasoning or maybe a splash of sauce would probably not have hurt the dish, but then again. With such a beautiful ingredient, I understood the need to go au naturel on the flavors. As for the sides, I’m surprisingly fond of cauliflower and believe it’s served far too little and far too infrequently, so luckily for me, this dish contained not one, not two, but three preparations of cauliflower to back the shrimp: One being a little, perfectly steamed flowerettes, the second some larger roasted/charred slices of cauliflower and the final a slightly sweet, creamy buttery puré, all lovely in their own way. The characteristic, mild taste of cauliflower played extremely well with the subtle seafood flavors of the shrimp and the three different preparations created an interesting subtle finesse and variation in taste and texture. The broccoli cress, a beautiful mess of bitter greens that formed the centerpiece of the plate dressed in a creamy dressing, was nicely, well, bitter and provided a sharp contrast to the depth of the cauliflower and the subtle seafood flavors of the prawn. A little too much contrast, some might argue. But, if like this guy, you’re a fan of bitterness, it’s not a terribly bad thing for the bitter components to shine through. Following another slight break and another topping of our glasses, the second dish of the evening started pouring out of the kitchen brought forth by our small army of friendly and helpful albeit slightly confused waiters. Confusion: I don’t know if it was the size of the crowd, the nature of the table layout or a lack of coordination, but the waiters seemed genuinely confused at times and dishes were handed out a little randomly with confused little smiles and the topping of glasses seemed to happen in much the same way. It’s more than possible, though, that the change in layout merely confused the wait staff and with the general laid back atmosphere of the place, one tended to forgive and forget and just smile at the general carnage that unfolded. Set in the center of large, deep dishes was an oversized ravioli generously stuffed with fresh, creamy, tangy goat’s cheese. On top of this rested a light airy, deeply complex and flavorsome almond espuma. Espuma, essentially, is a fancy culinary term for foam, a liquid that has been aerated to be light and airy. In this case, the liquid was, I assume, a mix of almond milk, cream, mushroom stock, and other ingredients. A deep, rich, toasted, flavorful sauce, that despite being rich and creamy appeared light and fluffy thanks to the aeration. This, by far, was my favorite dish of the evening. Goat cheese may well be an acquired taste, but if so, it’s one that I have acquired. I love it for its fresh, tangy taste and I absolutely adore how it worked with the creaminess of the pasta and the deep, toasted, nutty, earthy flavors of the almond espuma. Again, this was a seemingly simple dish, but it just worked. Perfectly. Bravo! Food allergies are rare, but they’re also deadly serious, no pun intended, and this, of course, begs the question: who is responsible for preventing allergic reactions to food and who should be faulted. Allergies are something that the kitchen should know about ahead of time so they can prepare special platings that can be enjoyed without fear of serious repercussions. That goes especially in upscale establishments such as this. So, is the kitchen to blame for not asking about possible allergies? Or the “victim” for not speaking up or examining the menu? The wait staff for not introducing the dishes or saying that this or that particular dish may cause problems for those allergic to this and that? Or someone else entirely? It’s not an easy question to answer, and I’m happy to report that no Swedes were harmed in the making of this review. He stopped eating the dish as soon as he was made aware of the presence of nuts and after a frantic half hour or so of waiting around for no reactions to happen, things went back to status quo. However, the drama could have been entirely avoided if only the dishes had been introduced to us as they were being served. I’ve seen that done in restaurants far below Rilano’s standards, so it would not be at all pretentious to walk through this step. Au contraire, it would actually also be a great help to diners who may or may not be aware of what they’re eating. The subject of allergies is even more of an issue in modern haute cuisine where things may not be entirely what they seem or carry “strange and unusual names”. People who’re allergic to shellfish probably know not to eat a giant prawn, but how does a person suffering from nut allergies cope with multi-compound, complex sauces that may have multiple layers of complex flavors that may not taste at all of nuts? They need to either be really aware themselves or be told exactly what they’re eating, lest they suffer some potentially horrible consequences. Let’s rejoice at the fact that this marvelous dish caused no bodily harm for anyone and honestly, though, if one dish of the evening was to die for, pun slightly intended, this one was it! In all of its simplicity, this may well be one of the best, most memorable dish I’ve had in 2014, and I’ve had some pretty good things this year! Slightly shaken but genuinely happy from the goat cheese foodgasm, we moved on to heavier and more substantial food. At this point, I decided to move on to red wine and had a glass of the red of choice: 2010 Montepulciano d’Abruzzo DOC from Farnese Vini a nice, well-rounded typical Italian red with all this entailed of fruitiness, oak, some tannic residue and a bit of spice. To be honest, though, the wine wasn’t really what interested me at this point. I never thought Wagyu could be a disappointment. The main meat course is supposed to be the highlight of any dining experience and to say I was excited about the main course of the evening would be an understatement. I love Wagyu! The iconic, rare, super tender and ridiculously expensive breed of cattle that produce genuine Kobe beef and is also bred other places around the world to produce Kobe-style beef. Wagyu, when cooked correctly produce beef that is more moist, more tender and more flavorful than anything. When cooked incorrectly, it becomes a very dull and extremely overpriced hunk of dead meat. Let it be known from the beginning that Rilano No. 6 know how to cook their beef. Every slice of meat that I saw, and there were a lot of portions being served, was cooked to perfection with just a tiny sear around the edges and everything else a perfect medium-rare perfection. To accompany the beautiful slices of beef, were some baby potatoes, a splash of concentrated sauce and a heavy drizzle of chimichurri (an Argentinian green sauce for grilled meats) made primarily from wild garlic. The entire plate, actually, was another study in minimalistic beauty. There was just one, tiny problem with this setup, though…The wild garlic! Beautiful as it looked and trendy as it is, it completely overpowered everything else on the plate, the subtle, juicy, meaty flavors of the outrageously expensive Wagyu beef included. I’m sorry, but for an establishments which prides itself on simplicity in cooking and flavors that compliment rather than overpower one another, this was a surprising decision and one that immensely disappointed me. So rarely does one get a chance to eat Wagyu, the Rolls Royce of beef, and when one does, it should shine and be allowed to power through, not be drowned in an extremely garlicky sauce! The sauce was great, from what we could taste of it, the potatoes nice and the beef superbly cooked, sadly, though, all impressions were lost in a pungent onslaught of wild garlic and it’s such a terrible shame because I’d love to give this dish rave reviews, I really would. But I can’t. All everybody at the table could agree on is that it tasted of garlic. Entirely too much of garlic and as such, the highlight of the evening became a bit of a dud. It’s not that it wasn’t well prepared, but for a place that prides itself on simplicity and complimentary, mingling flavors, this was a miss and we were, sadly, entirely too happy to move on to dessert. As far as desserts go, I’m not a big fan. I’m learning to respect and appreciate the sweet kitchen, but I’ve a long way to go. Still, I am a big fan of playfulness, experimental cooking and things that are just plain, well, different! And when I see a dessert course advertising the use of lemon grass and thai basil, my curiosity is instantly peaked! When our desserts were carefully and ceremoniously carried to the table, I couldn’t help to smile. Behind the unusual headline hid a playful twist on an old, well-known summer classic: Strawberries and cream. This version, though, was deconstructed into parts: cream panna cotta on the left, a pile of macerated strawberries in the middle and a serving of strawberry ice cream on the right, and some parts had been spiced up in a rather unusual way through the addition of a couple of decidedly Asian herbs. End of the line: Lemon grass panna cotta, Thai basil and strawberry. Curious and tasty. Herbs and other greens in dessert is something that’s been attempted widely, sometimes it works, sometimes it doesn’t, sometimes you get the feeling that savory ingredients are being used just for the sake of weirdness. In the case of Rilano’s lemon grass and Thai basil panna cotta, it simply worked! The panna cotta had been infused with just the right amount of lemon grass, giving it a noticeable lemony/herbal twist. Not too much, not too little. But just right. On top of the panna cotta floated a single leaf of Thai (Holy) basil, a slightly sweeter, more aromatic basil used primarily in Thai cooking. When consumed along with the lemon panna cotta, it provided a brief aromatic burst of wholly unusual but strangely appealing basil aroma to the dish. Simple, bold, unusual. Bravo! As for the macerated strawberries in the middle of the plate? Well, one can say what one wants about strawberries served outside of strawberry season. Me, I was never a fan. Strawberries, to me, should be eaten at the height of summer when they’re available locally and freshly picked. Even if the weather is warmer in Munich, eating strawberries in early April to me is just plain wrong. This is more of an issue with me than the dish, though, as the strawberries were surprisingly flavorful in their simplicity. One thing I will eat outside of summer, though, is frozen strawberries such as the strawberry ice cream served as the final element of our dessert. Standards are great, double standards are awesome! As was the strawberry ice cream at Rilano. Sweet, tart, perfectly churned consistency, and topped with a brownish crumble of some sort to provide a bit of contrast and crunch. I detected some anise flavors, too, which I believe may have come from a generous shot of Pernod, but whichever way they came about, they offered a nice extra dimension to the dish. After the to-die-for goat cheese ravioli, this was easily the second best effort of the evening and put a nice end to what was, essentially, a very nice and enjoyable dining experience with a few minor, but noticeable bumps along the way. So, how does one adequately sum up the hectic and at sometimes a little overwhelming experience we had at Rilano No. 6? Well, how about this… Rilano No. 6 offers simplistic yet beautiful and flavorful dishes in unique, beautiful and up-scale surroundings. The atmosphere is one of laid back luxury. The setting is grand but never posh and the upbeat feel of the place keeps things from getting too formal and stiff which is actually a welcome change when it comes to fine dining. The food, overall, was nicely prepared, served with a smile and beautifully plated using few, simplistic guidelines. The service was a little, uh, wobbly at best, but always friendly, considerate and helpful. Mistakes were made, things were even dropped at some point, but honestly, we were a pretty big and noisy crowd, so we may have put a bit of a strain on the wait staff which seemed young, a little inexperienced and slightly understaffed on this particular evening. Of mistakes there were a few during the course of the evening and sadly those few were quite noticeable and take up a lot of space in this review. They are, however, also mistakes that could be easily addressed for a much better dining experience. Taking a beautiful and flavorful cut of meat, particularly from Wagyu beef and drenching it in ingredients that totally overpower the natural beefy flavors, in my mind, is a crying shame. As is serving blazing hot chilies with an appetizer. Oh and it goes without saying that the sudden fear of your co-diner suffering a severe allergic reaction puts a bit of a dampener on the mood and excitement of the dining experience. These are things, though, that if addressed would, on their own, immensely have elevated the dining experience for me and have put it well above my already genuinely positive perception. I would, at some point in the future, love to go back, see these things addressed and watch Rilano No. 6 truly shine as I’m certain they’re capable of. As I’ve mentioned earlier, we took part of a special event with a special menu, so I can’t give you a low down on prices in terms of what we ate. As far as I can tell, the dishes we ate are not on the current menu, neither the a la carte or the tasting menu, but to give you some general idea, a four course tasting menu with wine pairings is available for a very reasonable €69. To me this seems more than reasonable given the skills demonstrated by the kitchen and the unique atmosphere of the place. In fact, I’d go so far as to call it excellent value for money, I’ll be back to grab that deal in a heart beat whenever I make it back to Munich and pray they’ve fixed whatever little sources of complaints I had! Hungry for more restaurant reviews from around the world: Why not check out my review of Denmark’s quaint Hindsgavl Slot? Or maybe New York City’s iconic River Cafe? Pro tip: While you’re here, do visit the bar! Remember when I said that when entering, one had the choice between turning left to go into the bar or right to go into the main dining room. Well, consequently, when one exits the dining room one faces the choice of heading left to get back to the street or continuing forward into the even more laid back atmosphere of the bar. Well, when faced with the choice, we concluded – spurred on by great food and good wine – that no Wednesday night would be complete without a few drinks at the bar. So onwards, into the bar we went. And I’m seriously glad we did! The bar at Rilano No. 6 – Great cocktails are made here by skilled people! The luxurious and grand yet entirely laid back atmosphere of the dining room carried on into the bar where a collection of plush chairs and sofas as well as a lengthy bar with comfortable stools along it stretch for several meters along the narrow, dimly lit and high ceilinged room. The music of choice is electronic but downbeat and at a reasonable level, at least during our visit. The bar staff is friendly, attentive, polite and dedicated, taking the time needed to fulfill an order and doing so in style whether your order be for a Red Bull and Vodka, a Mojito or an even more complicated cocktail. The selection is sublime, spanning an uncountable selection of Whisky and Bourbon, several different vodkas, at least ten or so different gins and a vast array of premium rums including the famed and outrageously expensive Havana Club 15 which, at €38 per shot, I decided to pass on after some serious consideration. No matter, though, with Hendricks Gin and Tonic apparently being considered a standard well drink and potent, artisan cocktails available in the €6-11 range, there are many great experiences to be had at reasonable prices. As a matter of fact, we found so much fun to be had that we ended out sticking around until we were kindly but firmly asked to pack up and leave the establishment at the 1 AM curfew. 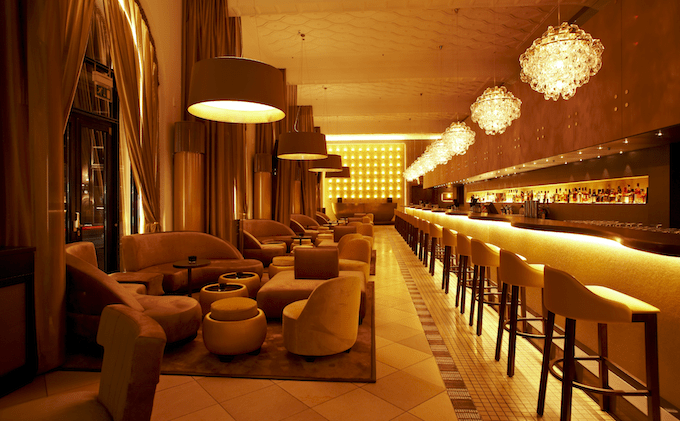 Which we did, reluctantly, well fed, well entertained and well buzzed after a lavish evening at Munich’s trendy Rilano No. 6. Image credits: Some images in this post are obviously not by yours truly. Rather I borrowed a few promotional photos. All images are taken from http://www.best-places.eu/glamourous-rilano-no-6-lenbach-palais/ where they appear without credit. This entry was posted in Restaurant Reviews and tagged beef, restaurant, review, seafood, spicy. Coming up: Fresh herbs with attitude from Growing Home!